The RIBA is delighted to present Pablo Bronstein: Conservatism, or The Long Reign of Pseudo Georgian Architecture, which opens today (21 September 2017) – the third in a series of special commissioned exhibitions with artists. 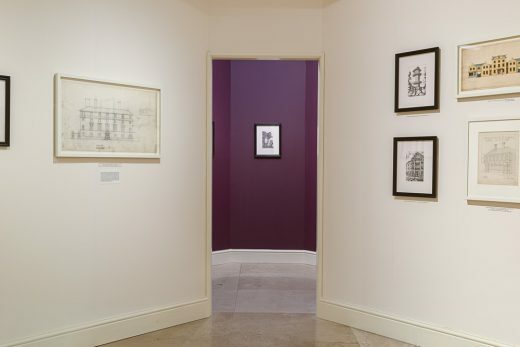 Fifty new drawings by the British-Argentinian artist Pablo Bronstein, are framed alongside a selection of rarely-seen historical Georgian and Neo-Georgian material from the RIBA Collections; the exhibition focusses on buildings constructed during the second half of the twentieth century in an ostensibly ‘Georgian’ style. Ink on Paper, 21 x 14 cm. Chosen by the artist, the archival material maps and situates Bronstein’s drawings in the context of architectural practise through time, revealing long-cherished ideals about social aspiration, urban fabric, identity and representation. From the RIBA Collections, renowned architectural figures such as Colin Campbell (1676-1729), Michael Searles (1751-1813) and Robert Adam (b.1948) are presented alongside lesser-known contributors to the neo-Georgian style while architecture practice Apparata (Nicholas Lobo Brennan and Astrid Smitham), adds a contemporary commentary through a new commission for the Foyer space of the RIBA Headquarters. The title of the exhibition ¬– which plays on the highly extended titles of eighteenth and nineteenth century social comedies and theatrical productions – contains the term ‘Pseudo-Georgian’, a neologism coined by the artist. The term describes a specific aesthetic commonly seen in recent British construction; a particular skein of developer-led, mass-produced construction which begins after the post-war enthusiasm for Modernist construction fades. 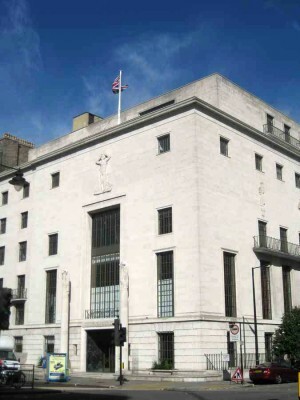 The mid-1970s saw a rise in heritage concerns, restoration and preservation as well as a renewed enthusiasm for historic styles in the rebuilding of Britain, and particularly London. In this context, the term Conservatism refers not to specific political interest, but rather to a tendency towards nostalgia, security and a historically inflected sense of national identity. Originally, architecture in the Georgian era – itself a period of great national confidence – developed a refined interpretation of Neo-Classicism, stripped back and presented as an approved declension of ‘good taste’. Subsequently, the popular style proliferated through architects and builders at all social levels. 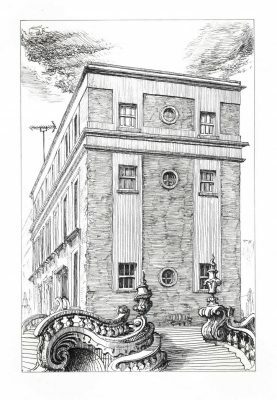 The various waves of Neo-Georgian architecture were motivated by similar intentions, to restore a sense of authority and historic continuity to Britain’s architectural fabric. The current exhibition examines the most recent wave of this tendency, examining what it means to be building in an ostensibly Georgian aesthetic today. The exhibition centres around the study made by Pablo Bronstein on recent architecture in London (published in the volume ‘Pseudo Georgian London’, 2017: Koenig Books), which he has been conducting over the past eighteen months. Identifying the characteristics of the buildings within his study, the artist together with members of the RIBA curatorial team and historic collections sought to construct a research project and subsequent narrative around the continuity of the Georgian aesthetic – looking at its origins in the mid-eighteenth century, through to subsequent revivals following the Victorian era and in the interwar period in Britain. Curated by Shumi Bose, (Curator, RIBA Public Programmes) with support from Suzie Pugh (Curator, RIBA Drawings & Archives Collections) fourteen works are displayed alongside the new drawings series by Bronstein, situating and contextualising the exhibition in a continuity of architectural practice. In order to address the historic proliferation of the ‘Pseudo Georgian’ aesthetic, two eighteenth century pattern books borrowed from the British Architectural Library are also displayed alongside objects from the artist’s own collection ¬– as well as a selection of critical articles culled from archival copies of Building magazine, one of the oldest publications to address the entire culture of Britain’s construction industry. The exhibition has been designed by Apparata (Nicholas Lobo Brennan & Astrid Smitham), in collaboration with the artist and the curatorial team. It approximates a ‘Pseudo-Georgian’ interior, using off-the-shelf products such as pre-routed panelling and cornices, and Regency-style wallpaper. The mass-produced aesthetic is selected to provide a context which is at once critical and strangely familiar, reflecting popular taste and mass consumption. photo © and courtesy RIBA Drawings Collection. The Architecture Gallery is divided into seven domestically scaled rooms, each of which have a specific focus. Following the introductory Ante-Room, which explains the context of the exhibition, the first space frames a selection of buildings at the scale of the City Block – larger than individual residences, yet smaller than a whole street, and often used for multiple and commercial functions. 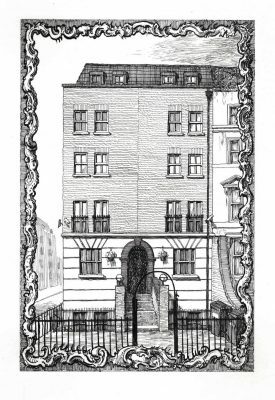 The next space addresses the very common form of the Residential Terrace – juxtaposing historic examples such as Colen Campbell’s design for Grosvenor Square – with Bronstein’s drawings of contemporary developments. The central space is given over to research, highlighting key historic works borrowed from the RIBA Drawings Collection, as well as a selection of critical articles and advertisements culled from archival issues of Building magazine, dating from 1975–2002. These articles attempt to contexualise the discussion surrounding the emergence of the ‘Pseudo Georgian’ in British construction. Subsequent rooms cover the typologies of Large Developments, Civic and Commercial buildings and Individual Houses. 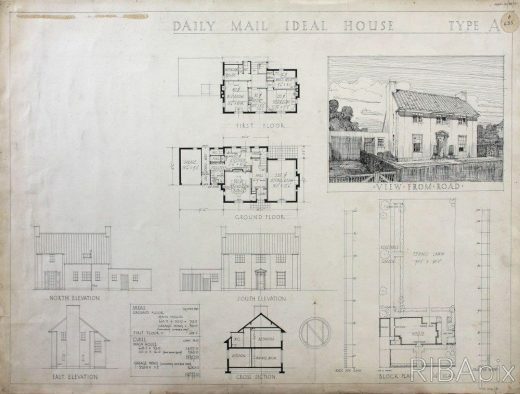 A particular highlight from the RIBA collections is a preliminary design for the City Police Station at Wood Street, by McMorran & Whitby ¬– a highly celebrated example of Neo-Georgian architecture currently under threat from a new development on an adjacent site. In line with its mission to support emerging architects, the RIBA has commissioned an installation for the foyer of its flagship building at 66 Portland Place, designed by Apparata (Nicholas Lobo Brennan & Astrid Smitham). 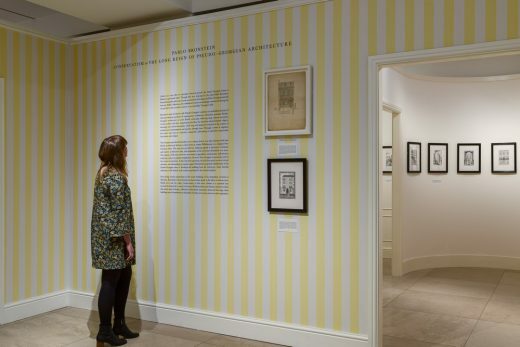 This installation forms a complement to the major exhibition featuring Pablo Bronstein in the Architecture Gallery. The installation, titled Abacus, Base, Capital, comprises a sculptural totem and augmented by furniture elements, arises from the practice’s belief that classical architecture is deployed as a progressive force, associated with leaps in human knowledge. A twenty-first century classicism, the architects claim, includes contradiction, tension and motion. 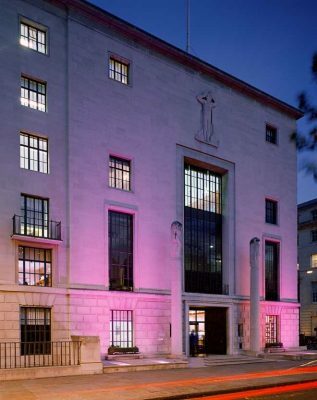 A special RIBA Late event, celebrating the themes and works within the exhibition, will be held on 10 October 2017. A series of public events including artist and architects’ talks, debates, film screenings, and workshops for families and children will support this programme. 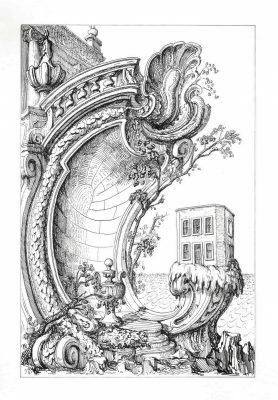 Pablo Bronstein (born 1977, Buenos Aires) is an Argentine artist based in London. 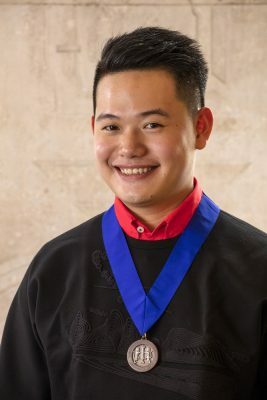 He attended Central Saint Martin’s College of Art and Design, at the University of the Arts London, the Slade School of Fine Art, UCL, and graduated from Goldsmiths College of Art. 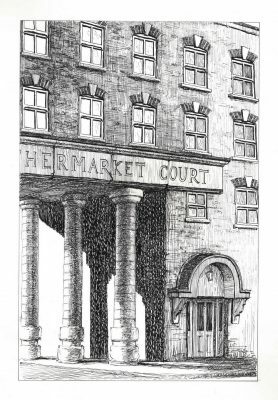 He specialises in architectural sketches depicting both imagined and existing building, made in ink and watercolour and incorporating styles from the Baroque to Postmodernism. His work also includes live performance: the Tate Britain commission in 2016, ‘Historic Dances in an Antique Setting’ involved choreographed movement within the imposing space of the Duveen galleries. 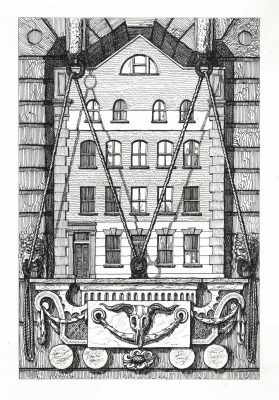 As part of a major new free exhibition Pablo Bronstein: Conservatism, or The Long Reign of Pseudo-Georgian Architecture (21 September 2017 – 11 February 2018), the Royal Institute of British Architects (RIBA) is organising a series of public events, including artist and architects’ talks, curator tours, film screenings, courses and workshops. A special RIBA Late event, celebrating the themes and works within the exhibition, will be held on 7 November 2017. Learning activities include a range of hands-on workshops for families and children, all led by teaching artists and RIBA architects. The third in a series of RIBA commissions, this exhibition anchors around the work of internationally renowned artist Pablo Bronstein, and his exploration of ‘ubiquitous’ neo-Georgian developments as an exemplar of British vernacular. Fifty new drawings of contemporary buildings – constructed during the second half of the twentieth century but in an ostensibly ‘Georgian’ style – will be on display for the first time, alongside a selection of rarely-seen historical material from the RIBA’s prestigious Drawings Collection. 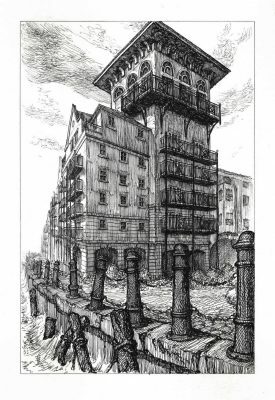 Chosen by the artist, the archival material situates Bronstein’s drawings in the context of architectural practise through time, revealing long-cherished ideals about social aspiration, urban fabric, identity and representation. 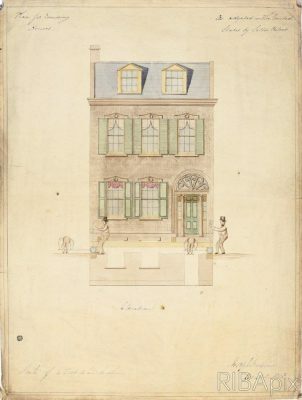 From the RIBA Collections, renowned architectural figures such as Colen Campbell (1676-1729), Michael Searles (1751-1813) and Robert Adam (b.1948) are presented alongside lesser-known contributors to the late neo-Georgian style. The exhibition is designed by Pablo Bronstein and architecture practice Apparata (Nicholas Lobo Brennan and Astrid Smitham).